Get to the eye candy. This film opens with the testing of an aircraft that an entrepreneur hopes to sell to the U.S. Air Force. A TV journalist conveniently informs us that the Air Force insignia have already been applied to the plane in anticipation--in other words, that the film will be using stock footage. (Kudos to the Classic Sci Fi blogspot for identifying the alleged "X-109" as footage of the F-104 Starfighter.) We experience five clumsy minutes of such footage (especially noticeable in an HD transfer) combined with process shots and bad effects to convey the idea that pilot Fred Norwood (John Ericson) is dodging a flying saucer that doesn't show up on radar. He gets canned in an uncomfortable scene. Then he joins his sister (Nan Leslie) and her husband in a stunning, ultra-mod living room that looks like a Tiki Room at the Jetsons. If the whole movie boasted similar design, it would be a great piece of eye candy, but we won't return to such outré visual strengths until the movie's last act. That's the work of Theobold Holsopple, and how can anyone with such a name not be a great designer? His resumé includes Rocketship X-M, Kronos, Daughter of Dr. Jekyll and The Fly, so let's admit that we're dealing with a master. In Washington DC, Hank Peters (Dan Duryea in his final role) recruits Norwood to drop into a remote village in Red China, where his agent Sam Archibald (James Hong) has reported a craft like the one Norwood saw. It's in an abandoned church that was burned by the Red Chinese, giving a probably deliberate spiritual aspect to this scientific pilgrimage. 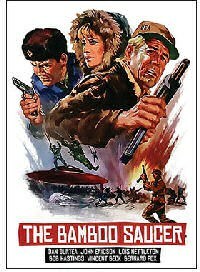 The long middle part of the movie is the trek of the American crew (including English character actor Bernard Fox) and their forced alliance with a Russian crew (including Lois Nettleton as a pretty engineer, guess where that's going) who are also avoiding Chinese troops on their way to the saucer. There are several examples of cross-cutting between Duryea and his Russian counterpart indulging in the same behaviors, like secretly checking their guns. This little Cold War parable of cooperation and mutual suspicion takes up the bulk of the action and everyone learns a valuable lesson, if they can live long enough to apply it. "You're not a perfect Marxist," says Norwood to the Russian honey after she prays over a fallen comrade, and she smiles. Then the final 20 minutes become the most interesting part of the movie by finally giving us what we want: a trip inside that saucer. This time, the colorful effects by John P. Fulton and Glen Robinson are entertaining, bold, and even trippy, and Holsopple's interior design is sleek and timeless. Fulton is credited with the original story along with Alford "Rip" Van Ronkel, who co-wrote the landmark Destination Moon (1950). That explains why this movie feels like a '50s project that somehow got made in the year of 2001: A Space Odyssey. Indeed, Van Ronkel died in 1965 and his previous credit was in 1961, so this property had clearly been sitting around in un-development hell. Writer/director Frank Telford certainly saves his strengths for the ending, although I must admit the actors bring conviction (except when speaking Russian) and the pace doesn't lag--much. I expected this to be much duller than it turned out to be, and if that's praise, so be it.